Anyway, he had the biggest mouth in the building. And it's not like he wasn't given a chance at being HC. Maybe you forgot that he drove the Jets off a cliff before the Bills picked him out of a Jersey dumpster. Every Jets fan knew what was coming for the Bills. This revisionist Rex hagiography is more a symptom (sadly) of the current state of the Bills. In Peter's defence - this isn't a revisionist position for him. He believed this at the time too. I thought he was wrong then and is still wrong now but he always thought Rex was a good coach being undermined. I think he was a bad coach making a fool out of himself by half assing it. If there are leaks that you are going to be fired since before the start of the second season, that is text book undermined. It makes it pretty darn difficult to coach a team when your players keep on hearing that you are going to get fired. Yet his owner put those rumors to rest publicly, saying it would be wrong to fire Rex before the season's end. But then he fired him before the season's end. But if you feel you are on the hot seat in the beginning of the season, you would best do a better job that season. Rex didn't. Pegula was the one who told Rex before the season, improve or you're gone. Should’ve kept Lynn. I think we’d be in a much better spot. Look at the chargers, their offense is humming. They are supremely talented on offense. How much of their success is a product of Lynn? Thanks for pointing out that this is not a new position. As for the rest, I obviously disagree. I think "half assing it" and "buffoon" (a word others have used) are just something you guys use to fit your narrative. I am not sure why having a personality is now something that is bad. I cannot listen to McCoach and his drivel anymore - and he is doing the same thing to the team. He has sucked the life out of this team. Rex should have been given at least through the end of his contract. And, as much as McClappy bothers me and I have real doubts about whether to trust McBeane going forward, I don't think that they should be fired in less than two years. He double sucked once he brought his brother Fredo in. Not sure why he was fired, I do know there were bidding wars for his services once fired by Buffalo; a sought HC candidate! As much as I love the Pegulas, firing their head coach in less than two years (and firing that head coach) was a monumental mistake. You can read all of my old posts for the reasons why. As for the leaks, someone leaked to Vic before the season and to certain guys like LaCanfora during the season . . . and just before the biggest game of the year that year (Pittsburgh) that he was going to get fired. I always suspected that Whaley was behind those leaks. Karma got Whaley in the end. Yes, those leaks (and presumably whatever else Whaley did behind the scenes) undermined the head football coach. It is never good to be the head football coach when there are constant rumors that you are going to get fired. It is not good for the coach and it does nothing to help the coach with the players he is supposed to lead. I wonder if that is one of the reasons a guy like Gilmore thought that tackling was not part of his job. Just my two cents. I am under no illusions that I am going to convince the Rex haters to come around. The sad news is that both the Rex haters and the rest of us are stuck with this completely unwatchable team that McBeane have sucked the life out of and gets blown out on a regular basis. We now have a -145 point differential with only 9 games played. The next worst team is the Raiders who are -111. We were - 57 last year and + 21 the year before. McBeane have a plan and are following that plan, although it is quite painful to watch at the moment... Rex's plan was to bring in his brother so he didn't have to work as much and they could go to Sabres games together. The thing was doomed from the beginning. Rex was just a shiny new toy for the pegulas. He wasn't the front offices hire and everything just went downhill and seemed like Rex and Whaley both had supporters within the organization leaking info to support their guy. It was 100% a mess with Rex because of them. And it is 100% a mess now because of them. They have enough money, go buy some third tier TV station you and your kids can be on and be C-list celebrities on "Real Housewives of Buffalo". It's all status with them, or how they perceive it to be viewed. I think that was the final straw. It was a trainwreck. I think the issues went on for longer than that behind the scenes. After the Jets crash and burn, and after 31 games with the Bills, I just don't see a convincing argument that Rex Ryan was a HC worthy of another year as HC. I don't know what you thought he was going to do with another year. The guy had already proven on two teams that he wasn't adequate for that job. I don't believe in the theory that you should continue to employ poorly performing employees simply because it's "too early" to fire them. Also, the Bills poor performance now is not a convincing argument that Rex should still be HC here. Makes no sense. IMO, I think his, and his brother's laziness is what got him fired. The news filtering out after he got fired painted a portrait of two men who were for all intents and purposes, just mailing it in. You can be a hard worker and lose. You can't be lazy and lose. Nobody writing the checks is going to stand for that. As I said, I am under no illusions that I am ever going to convince the Rex haters. I do think it is funny though how some of the McCoach defenders castigated Rex when we had 11 men on the field when one of our DBs got hurt, but never seem to mention that McCoach had 15 guys on the field against the Pats last year. That might even be an NFL record. I have no idea whether you were one of those guys, but it seems like beauty is in the eye of the beholder. There are some who had it in for Rex and they will always look at him through that prism. Oh well. We all have to suffer now with this completely unwatchable team that McBeane have sucked the life out of. Happy days . . . .
you are seriously spending hours of your life defending Rex Ryan? Rex was fired before even 2 years was up because he was a disaster in so many areas. He had lost the respect of the owner, the players and the fans (and rightfully so). He came here to revamp the defense and made it much worse, he brought in his train wreck brother. He had a "spiritual advisor" advise him on when to throw a flag on a challenge. He was full of talk and bravado and full of sh$t as well. There was probably no more deserved firing in the drought than Rex. Now moving forward the Pegulas should be applying the exact same criteria to McD and Beane. Yes they were not a stupidly arrogant, they didn't promise the moon like Rex. They did break the drought, and seem to have fixed the D somewhat etc. However, they have now made several blunders that if they were anywhere else but Buffalo they would be on the hot seat or be about to be fired. 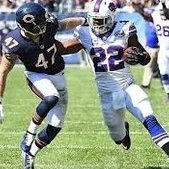 The Offense is the worst I have ever seen here in Buffalo and because it is so bad it is destroying the gains they have made on defense. They have bungled the QB situation irreparably. Their so called "process" doesn't seem to be a process at all. They seem to use religious faith as some sort of bizarre metric of NFL quality. They have embarrassed this franchise on even more occasions than Rex did so how can people say that they deserve to be treated differently? Rex deserved to be fired before 2 years was up and both McD and Beane deserve to be in that firing zone right now. I'm on record here many times with my concerns that McD may not have any idea as to how to rebuild the team he just blew up. Having said that, it was clear what the Bills were getting in Rex. He was no different than he was with the Jets, where as per usual with Rex, he was happy to blame others (his GM, for one) for his failures. Were "leaks" about him being on the seat what ruined his chances there too? Because it was far worse there than in Buffalo in that regard. His failure was completely predictable. This was an easy call--and many of us here made that call. It was like calling your own 2 sided coin. Rex was living off the past and was checked out. He turned the defense over to his brother when he was on the hot seat. He got what he deserved. I defend what I believe in . . . so yes. 3) Rex was given every opportunity during press conferences in his last year of being the Bills head coach to point the finger elsewhere and he did not. For example, in both years he was coach, he defended guys to a fault - even Mario who went on strike during games. The one thing McCoach got right was he insisted on his own guy as the GM so that he would have a guy who would not undermine him. Rex should have done that especially after what he went through in NY with his last GM there. they're different situations, but Rex was ruining the team. He took a championship quality defense and turned them into an average one at best. I think he was looking for a final paycheck before retirement and this was it. I think Pegula's realized he was a bad hire and took care of it. I'm not sure what they think of McBeane. If the plan was to rid themselves of contracts and rebuild throught the draft with lot's of cap space, they probably have time to work on that. I'm guessing they told Pegula's that and they are ok with it.